This report is the result of over 18 months of consultations by the SDSN, with contributions from nearly 500 organizations. The SDSN Thematic Groups, a large number of UN agencies and other international institutions, national statistical offices, civil society organizations, academia, and businesses have provided expert input that has helped us improve the indicator framework. We are particularly grateful for the detailed comments received during two public consultations, the first from February to March 2014, and the second in January 2015. Comments submitted during these consultations and changes made to our report are provided on our website. Indicators will be the backbone of monitoring progress towards the SDGs. A sound indicator framework will turn the SDGs and their targets into a management tool to help countries develop implementation strategies and allocate resources accordingly, as well as a report card to measure progress towards sustainable development and help ensure the accountability of all stakeholders for achieving the SDGs. The focus of SDG monitoring will be at the national level. 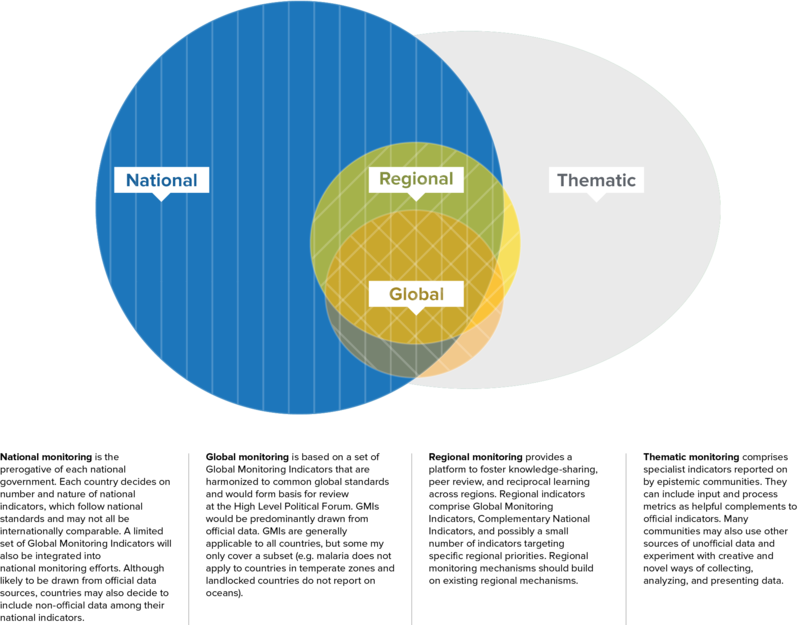 Complementary monitoring will occur at global, regional, and thematic levels. Each level of monitoring requires different types of indicators. The SDSN report proposes 100 Global Monitoring Indicators, accompanied by suggestions for Complementary National Indicators, which together track the full range of SDGs and targets in an integrated, clear, and effective manner. Each country should pick the number and range of Complementary National Indicators that best suit its needs and capacity to collect and analyze data. Given the breadth of country circumstances, we expect substantial variation in the number and type of national indicators that countries will adopt. We underscore that the preliminary list of Complementary National Indicators is far from exhaustive and meant only for inspiration and illustration. This is new indicator web platform allows you to easily search the set of indicators proposed in the SDSN report Indicators and a Monitoring Framework for Sustainable Development Goals: Launching a data revolution for the SDGs. Through this web platform, you can easily view the list of Global Monitoring Indicators (GMI) by goal and by target, as outlined in Tables 1 and 2 of the report. Clicking on an indicator allows you see its rationale and definition, potential levels of disaggregation, and some of its limitations. We also identify the primary data source, which is the preferred source of robust data for the indicator. Further, we list the potential lead agencies that could be responsible for compiling the data at the international level, and include a preliminary assessment of data availability, which was conducted by the Friends of the Chair Group on Broader Measures of Progress in April 2014. In the right-hand sidebar, we show all the relevant goals and targets, which helps to demonstrate how a single indicator can be multi-purpose and how the indicator and monitoring framework can be integrated and cross-cutting.